The much awaited 7 day long Srimad Bhagavata Saptaham at Karya Siddhi Hanuman Temple Frisco, TX in the evenings and Dallas GOD Utsav during the day, started on Dec 21 2009. By Divine grace, Sadhguru’s Holy Padukas arrived from Boston at about 12:00 midnight of 20th December symbolizing the arrival of the Lord himself for the Saptaham. Holy Padukas were received with Poorna Kumba with Mahamantra chanting at Sri.Thiagaraj & Smt. Sudha’s residence. Up on arrival mangala arati was performed followed by Dolotsavam to put our Thakurji and Sadhguru to sleep. The GOD Utsav started with prabhodanam by singing prabhodana kirtans and Thirupavai, followed by Holy Paduka pooja. At about 11:00 AM, Srimad Bhagavata Sangraha Parayanam started with Ganapathy pooja and Sankalpam. Sri.Narayanan led the Parayanam of Srimad Bhagavata Mahatmiyam, Narada Charithram, Kunti Stuti, Bhisma Stuti and Suka Stuti along with beautiful doscourse in Tamil. Parayana session for the day was concluded with Bhagavata sampradaya pooja followed by Maha Prasad. In the afternoon, Sri.Sriram from Houston, TX gave an excellent introductory pravachan to the Nava Yogi Upakhyana, which was continued on the afternoons of the Utsav. At 4:30 PM, The Saptaha program at Karya Siddhi Hanuman Temple started with Sri Thyagarajar Krithis sung by the disciples of Smt. Deepa Srinivasan. Dallas GOD Satsang’s Chi.NirmalaSriSkandhan recited Dhyana slokas and Smt.Sudhaji, Smt.Boomaji & Smt.Shyamalaji recited Kunti Stuti. Sri.Ramanujamji’s Saptaham discourse started with Srimad Bhagavata Mahatmiyam and Adhikari Skanda which was attended by about 200 devotees. Mahaprasad was served following the Hanuman Chalisa and temple Aarti. Dolotsavam was performed in the night at Sri.Thiagaraj & Smt. Sudha’s residence. After prabhodanam and Paduka pooja at Sri.Thiagaraj & Smt Sudha’ residence, Sri Narayanan led the sangraha parayanam and pravachanam of Vidhura Maithreya Samvadham, Varaha Avataram, Kapila Avataram, Daksha Charitram and Rudra Geetam, Dhruva Charithram from Cantos 3 and 4. This was followed Bhagavata sampradaya pooja and mahaprasad for all devotees. In the afternoon Sri Sriram continued Nava yogi upakhyana with first sloka by Kavi Yogi. He soulfully explained ‘kayena vaacha manasendriyar vaa’ and how one should offer everything to the Lord by citing the example of Karna. Evening events at Karyasiddhi Hanuman temple started off with Oothukadu Venkata Subbaiyer Kritis by Smt. Seetha Chandrasekar and group. Dallas GOD Satsang’s Chi.Prithvi, Chi.Varun, Chi.Arvind, Chi.Eshwar and Chi.Nirmal recited Dhyana slokas. Sri.Ramanujamji continued the Saptaha pravachan elaborating Adhikari skanda on Parikshit getting ready to listen to Bhagavatam, Krishna saving Uthara, Aswathama’s vow to demolish Pandava lineage, Kunti Stuti, Bhisma Stuti and Krishna leaving for Dwaraka. Ramanujamji beautifully highlighted that ‘In a crisis we understand helplessness’. This was followed by Hanuman Chalisa, Aarti and Mahaprasad at the temple. Dolotsavam was performed in the night at Sri.Mayakoothan & Smt. Jayanthi’s residence. In the morning after probodhanam and Paduka pooja at Sri.Mayakoothan & Smt.Jayanthi’s residence, Sri Narayanan led the sangraha parayanam and pravachanam of Jadabaradhar charithram, conversation between Rahuganan and Jadabarathar, Ajamila Charithram from Cantos 5 and 6. Smt Nithya from Boston discoursed on Vrithrasura Vadham. All the devotees were encouraged by Sri Narayanan to recite Ajamila Upakyanam and Narayana Kavacha on a round robin basis. This was followed by Bhagavata sampradaya pooja and mahaprasad. In the afternoon Smt. Nisha from Houston took over the Nava yogi Upakhyana. She beautifully highlighted as to how Bhagwan runs after Prema Bhaktas through incidences from the lives of devotees like Gorakhumbar where Lord Panduranga left Pandapur to serve Gorakhumbar. Evening events at Karyasiddhi Hanuman temple started off with Sri Narayana Theerthar Tharangams by disciples of Smt. Padma Ashok Krishnan. Sri. Ramanujam continued the Saptaha pravachan on the Adhikari Skanda as he ensured that all the devotees who had gathered would become true adhikaris by detailing on adhikari skanda for the third consecutive day. Ramanajumji highlighted how valuble an adhikari and parama rasika is by saying that Sukar came to Naimisharanya only for Parikshit. Ramanujamji said ‘A beauty of a satsang is that even if it does not answer all our questions, it outgrows the intention to find answers to these questions, the questions do not matter anymore’. Day 3 ended with how Kali influenced Parikshit and how Sukar started to narrate Bhagavata to him. This was followed by Hanuman Chalisa, Aarti and Mahaprasad at the temple and Dolostavam at Sri.Mayaji & Smt.Jayathiji’s residence. In the morning after Probodhanam at Sri.Mayaji & Smt.Jayanthiji’s residence, Sri Narayanan led the sangraha parayanam of Prahlada Charithram from Canto 7. Smt Nitya from Boston gave a bakthi filled pravachan on Prahlada charitra. 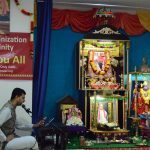 All the devotees were encouraged by Sri Narayanan to recite Prahlada stuti. Smt Nitya highlighted as to how Bhagwan appeared solely to honor the words of Baktha Prahalada through ‘sathyam vidhaathum” bhava and how He calls Prahlad a ‘Mahatma’ which happens to be the only place in Srimad Bagawatham where Bhagwan addresses a bhakta as a ‘Mahatma’. In the afternoon Smt Nisha continued pravachanam on Nava yogi upakyanam by Hari Yogi from 11th Canto of Srimad Bagawatham. Nishaji beautifully highlighted the qualities of a Bagawathothamas who see Bhagwan in everything and everywhere through Sant Eknath and Sant Naamdevs’ Baktha charitras where Lord Panduranga appeared as a donkey and a dog respectively. She beautifully recounted on how King Nimi’s two questions 1) How to get rid of fear 2) What is Bhagavata Dharmam to the Nava Yogis were answered by Nava yogi Upakyanam and how Narada used it to answer Vasudeva. Evening events at Karyasiddhi Hanuman temple started off with Bhajans by Sri.Prabhu and group. All the devotees by Guru’s grace proved to be true ‘Adhikaris’ by braving extremely bad weather and driving conditions to do Bhagavata Shravanam. Ramanujamji talked on Kapila, Daksha, Dhruva charithras. Ramanujamji noted that ‘Once a baktha listens to Srimad Bhagavata he becomes a bride who is engaged and becomes eternally happy’. Ramanujamji also highlighted about Karana Guru (One’s Mother) and Karya Guru(the Guru shows us Bhagwan). This was followed by Hanuman Chalisa,Aarti and Mahaprasad at the temple and Dolostavam at Sri.Mayaji & Smt.Jayanthiji’s residence. In the morning after Probodhanam Sri Narayanan ushered in our Guru Maharaj to the Satsang by ‘Vijayi Bhavathu Gurnatha’ kirtan and led the sangraha parayanam of Gajendra Moksham and Lakshmi Aheerbhavam from Canto 8. Gurus grace showered again with Lakshmi Aheerbhavam falling on a Friday. Sri Narayanan pointed out that we learn from Amrutha Madhanam/ Lakshmiaheerbhavam story to look for the best thing in this world – ‘Bhagwan’ and also use it is as an important story for narrating to our kids. In the afternoon, after Mahaprasad, Nishaji continued pravachan on Nava yogi upakyanam by Hari Yogi from 11th Canto of Srimad Bagawatham. 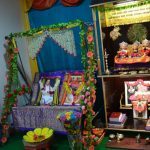 She highlighted the qualities of the Bagawathothamas who never care about gross money through Sant Tukaram, Saint Vallabhacharya, Saint Thyagaraja Baktha charitras. Evening events at Karyasiddhi Hanuman temple started off with Annamacharya kritis by Smt. Meenakshi Anipindi and group. Ramanujamji dedicated the whole night to ‘Ajamila Charitram’. It was evidently the most captivating discourse of the Saptaham with Ramanujamji teaching every one the greatness of the naama. Ramanujamji stressed that ‘Acceptance has to come first before one can experience it’ and ‘Direct Perception and Inference have to be supplemented by acceptance’ of vedas and sastras. This was followed by Hanuman Chalisa, Aarti and Mahaprasad at the temple and Dolostavam at Sri.Mayaji & Smt.Jayanthiji’s residence. In the morning after Probodhanam, Sri.Ramanujamji led the sangraha parayanam of Ambarisha Charithra from Canto 9 and Sri Narayanan led the sangraha parayanam of ‘Krishna Jananam” from Canto 10. Sri Krishna Jananam was celebrated by offering sweets, savories, butter, rice flakes and fruits. Sri.Mayaji & Smt.Jayanthiji gave ‘Vera dhanam’ (Paddy) to all the devotees. Earlier the divine pictures of our Thakurji & Sadhguru were decorated with rose petal garlands and jasmine strings imported specially from India for the occasion. In the afternoon after Mahaprasad, Nandotsavam was celebrated where our baby krishna was placed in a cradle and Kolattam was performed by children, women and men by singing songs composed by Sri Sri Swamiji. This was followed by Nishaji’s navayogi upakyanam pravachan. Evening events at Karyasiddhi Hanuman temple started off with our Sadhguru HH SriSriMuralidhara Swamiji’s Kirtans by GOD Satsang members. Ramanujamji continued the Saptaha pravachan with ‘Krishna Jananam’. He beautifully explained the “Tham adbudham balakam” sloka. This was followed by Hanuman Chalisa, Aarti and Mahaprasad at the temple. This was followed by a 3 hour Divya Nama at Sri.Mayaji & Smt. Jayanthiji’s residence, around 10:00 PM. Lord Sri Krishna’s idol was placed in the middle and all the children and men went around singing bhajans. Presence of Mridhangam and Dolak made the bhajans lively. This was followed by Dolotsavam. In the morning after Probodhanam, Sri.Ramanujamji led the parayanam and discourse of Venu Geetham, Gopika Geetham, Krishna teaching Uddhava a lesson through Gopis and Rukmini Kalyanam. Earlier, the divine portraits were beautifully decorated with Garlands and other flowers. Paruppu Thengai, Seer murukku and varieties of sweets were offered to the new weds. This was yet another grace of the sadguru that the day of Rukmini Kalyanam fell on Vaikunta Ekadasi. 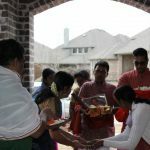 In the afternoon, Srimad Bhagawata Sangraha Parayanam was led by Sri.Sriram of Houston, followed by Anjaneya utsavam marking the conclusion of the GOD utsav. Vadamala, Curd Aval (rice flakes) and butter were offered to Lord Sri Anjaneya with the singing of Sadhguru’s kirtans on Lord Sri Anjaneya. Evening events at Karyasiddhi Hanuman temple started off with Sri.Ramanujamji’s saptaha pravachan on Krishna Leela and Rukmini Kalyanam. Special homage was paid to the Lord Sri Karya Siddhi hanuman, the presiding deity of the temple, with clothes, vadamala, plantain garland, garland of grapes, variety fruit basket, Dry fruits & nuts while GOD members singing Sri Swamiji’s kirtan “Anjaneya Anjaneya Anjaneya Rama”. This was followed by a wonderful ‘Gopa Kuteeram’ skit performed by children under the guidance of Smt.Sudhaji & group. Sri. 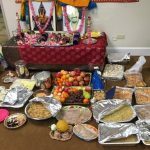 Thiyagarajan thanked Karya Siddhi hanuman temple management and all volunteers for their dedicated service during the seven days of Saptaham. Sri. Ramanujamji honored Dr. Prakasa Raoji, as a token of GOD’s gratitude to the Temple. The Grand finale of the week long program was the Vaikunta Ekadasi Special Satsang by Sri.Ramanujamji followed by a mesmerizing 7 minutes of Mass prayer with Maha mantra chanting where over 400 devotees were loudly singing the Mahamantra with their hands clapping.. Blessed were the devotees who were seen shedding tears out of joy. Day 7 ended with concluding part of Navayogi upakhyana by Smt. Nishaji and Dolostavam at Sri.Mayaji & Smt. Jayanthiji’s residence. Dallas Saptaham 2009 was an unforgettable divine experience to all the participants where everyone felt the divine presence and grace throughout. The devotees departed with prayers to Takurji and sadguru to bestow them with more and more satsangs of this type in the time to come. 2 Responses to "Bhagawata Saptaham and GOD Utsav -Dallas"
lively atmosphere. Each persons day should start with the chant of hare rama hare rama……Atmasamarpanam for an earnest prayer to make the day as a peaceful one.